As I'd pointed out in the comments of this blog entry (it'd be really nice if there were a way to link directly to a particular comment... ), the once-great Starcade video arcade at Disneyland had become a sad shadow of its former self. Back in the early 80's, it was an amazing arcade, jammed full of video games, spanning two floors. When Disney released Tron: Legacy, they opened up Flynn's Arcade as part of ElecTRONica in California Adventure. I never managed to get over and see it though, since the one time I was there while it was still in place, that park had already closed for the day (at 9PM, which seems ridiculous). 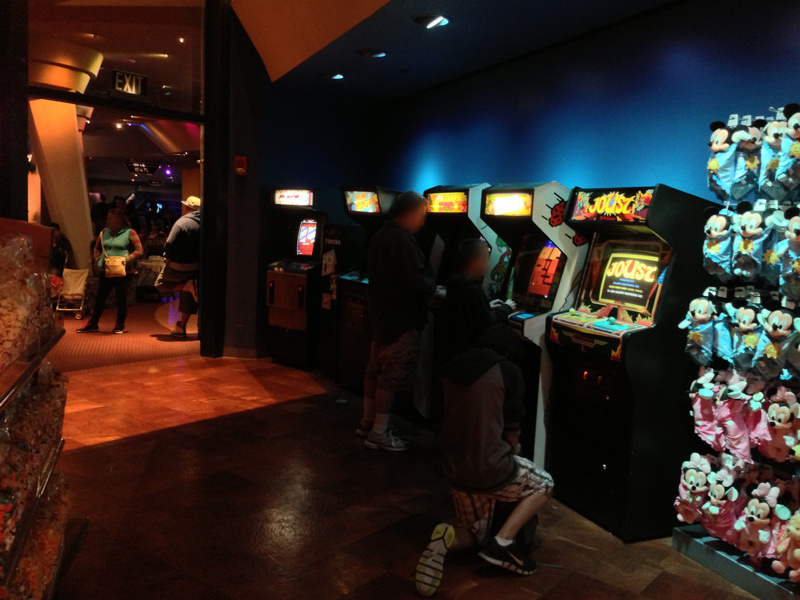 Flynn's got shut down a few weeks later, and arcades were once again dead at Disneyland. Then I'd heard that with the release of Wreck-It Ralph, they'd put a couple of Fix-It Felix, Jr. arcade games in at Starcade, back in the main park. Since I was going to be there last week, I thought I should check it out. I didn't know if the Fix-It Felix, Jr.'s were still there, or if any games were left at all. I had already played the Fix-It Felix, Jr. arcade game at a Disney event, but playing classic video games, even fake ones, is never a bad thing. So even if that one game was all that was there, it was worth stopping by. 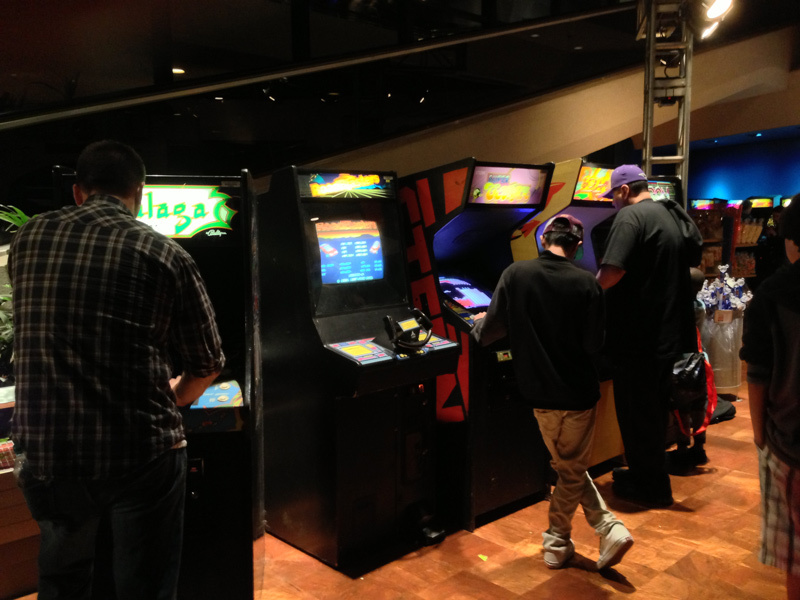 From left, near the Space Mountain entrance: Arkanoid, token machine, Yie-Ar Kung-Fu, Track and Field (obscured), Centipede, Dig-Dug, Joust. The classics were back! And not one or two machines, but nearly two-dozen of them. And while hardly a return to the arcade's glory days, there were more than I'd ever expected, and all (mostly) in good working condition. Best of all - they were actually being played! It was difficult to take clear pictures of everything because there were usually people in front of the machines. Kids, adults, adolescents... and not even playing them ironically either. But enjoying them! Timeless classics, indeed. The token machine near the Space Mountain entrance was even typically fussy about taking dollar bills. I saw more than a few people having to "iron" out their money by pulling it across the edge of the machine to get it to work. 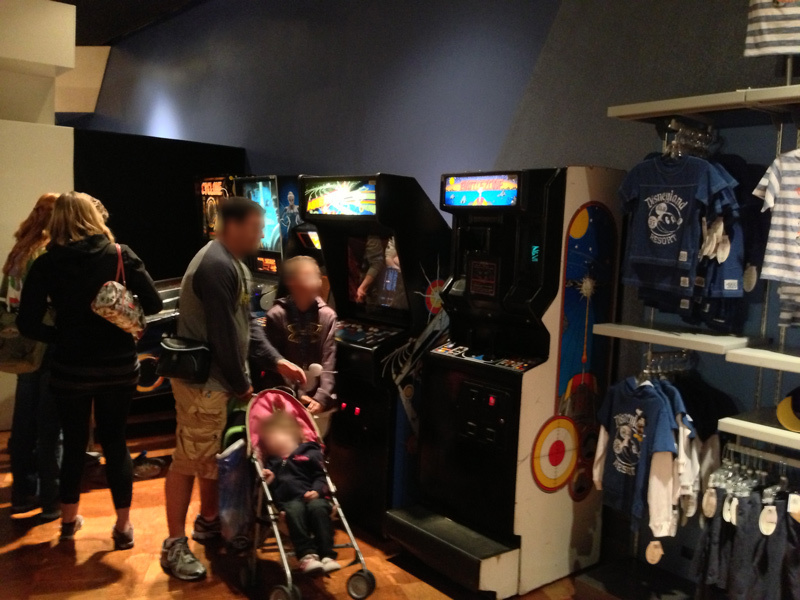 While probably not intentional on Disney's part, glitchy token machines are as much a part of the arcade experience as the games themselves. I was disappointed though to see that the tokens were just generic designs, and nothing unique to Disneyland, Wreck-It Ralph or Starcade. C'mon Disney, they don't cost that much! Now certainly, these aren't the money-makers they once were, but neither were they abandoned, derelict, lonely games sitting forgotten in a corner somewhere. People were enjoying them. It was hard to get any time on Fix-It Felix Jr., despite there being four of them in the arcade. From left, two Fix-It Felix, Jr.'s, R-Type, Donkey Kong Junior, two more Fix-It Felix, Jr.'s. My heart just about skipped a beat (could be the cholesterol build-up) when I saw my all-time favorite arcade game there as well: Battlezone! It was more than I would've hoped for. It seemed they tried to have at least some of the games shown in Litwak's arcade from Wreck-It Ralph. Curiously though, no Q*bert. Guess he's still unemployed. Cylone and Tron: Legacy pinball machines, Missile Command (obscured), Asteroids, Battlezone. 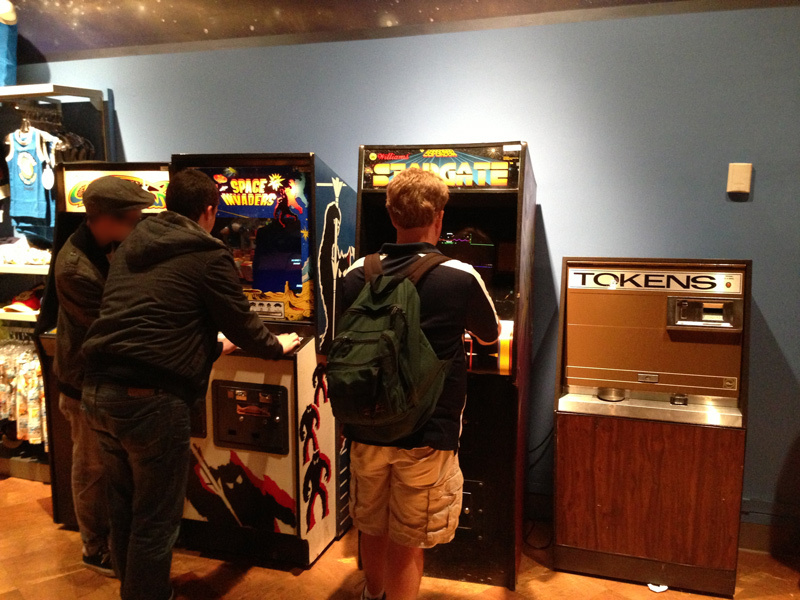 Galaxian, Space Invaders, Stargate, another token machine. 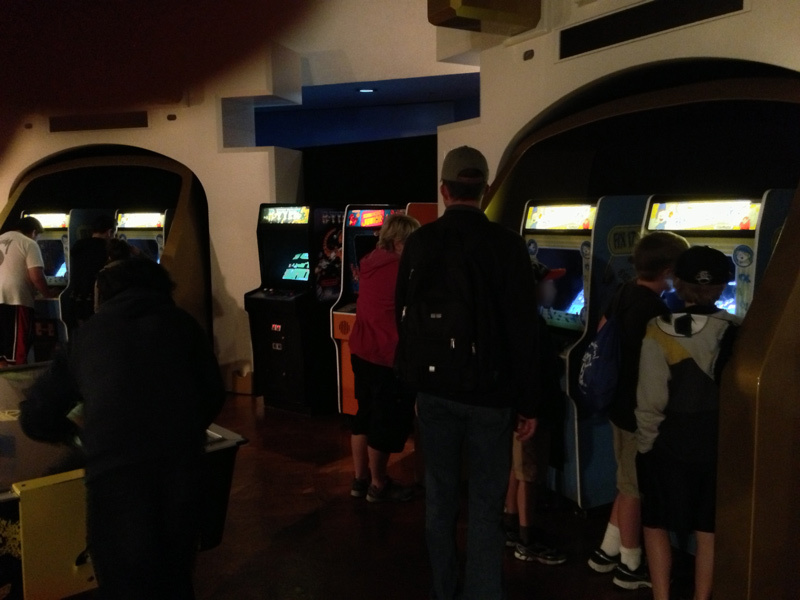 Galaga, Road Blasters, Super Cobra, Scramble, Tron. In the far distance: the games near the Space Mountain entrance. Most of the games were in good working condition. Some of the monitors were faded (particularly Scramble) and dip switch settings were all over the place - Asteroids was apparently set on "impossible" since I've never seen space rocks move that fast, and Battlezone was set to not give any extra lives, plus its joysticks were shot - they wouldn't return to center, making the game tough to play. Still, I probably blew five bucks in tokens there, in an hour or so. Could've been longer - I honestly lost track of time. I embarrassed myself on Arkanoid (paddle controller had too much play in it - might be worn gears), I had lost pretty-much all of my skill on Joust (but managed to get on the high score list anyway), had a disastrous outing on Stargate (nothing new there - never could play that nearly as well as Defender), did okay on Tron (almost got through the third level, which is about as far as I could remember the patterns), nearly got to the base on Scramble, and had a catastrophically bad game on Super Cobra. Fix-It Felix, Jr. was set on free play, and I managed to get in a few games. It plays considerably different from the iOS version - I didn't capture any video of it (it's hard to play and shoot with your cell phone at the same time), but in short it's much, much harder. Ralph's bricks cover several rows of windows as they fall, making them very hard to dodge, and requiring a completely different approach to the game. On the other hand, when Felix fixes a window with broken top and bottom panes, you only have to hit "fix" once to fix the whole window (in the other versions, each pane must be fixed). I never got past the first screen, in part because of an intermittent joystick problem on the machine I was on. But a poor dancer blames the floor and all that, so no excuses. 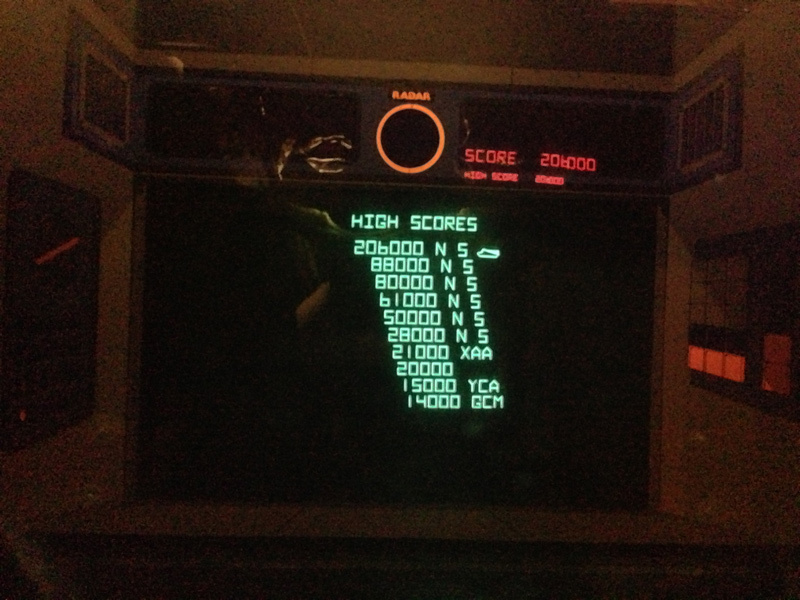 Even though Battlezone was fairly trashed, I was determined to play it and beat 100,000 points. On my sixth game, I'd finally adapted to the wonky controls enough to clear that score, and then some. Not bad for busted joysticks, a twitchy monitor and no extra lives. It's great to see some of the classics back at Disneyland. They just belong there. They should be a permanent fixture. They just need a little more fixing up and tweaking to make them so people can play them without getting frustrated. Hopefully they won't remove them again. They certainly have enough space there left for selling t-shirts and merchandise so it wouldn't hurt anything to leave them. And people enjoyed playing them. I certainly did. It was the closest I've been to some of those machines in many, many years, and I'd go back to Disneyland just to spend time in the arcade playing them. If, of course, I knew they were still there and in good working condition. Mainly because I got into the park for free. But still, the tokens cost money. Great news. I just might need to plan a trip to Anaheim this year.